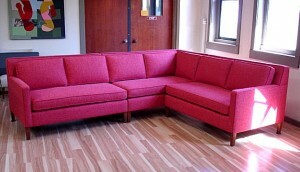 This is our latest custom made, eco-friendly, 3 piece sectional. 5/4 Alder frame construction with 100% organic wool over latex core cushions. It is designed so that the three seat cushions are all the same size to be interchangeable. They can be flipped and swapped! The corner piece can be removed and the two end pieces pushed together to make sofa.